If you’re Indian then this article is obvious, but still, it might serve as useful content to share with your non-Indian friends as to why they need to experience an Indian wedding. Also, it’s important to note that an Indian Wedding isn’t a one-day affair. It spans from a week sometimes two depending on the tradition. Today we wanted to share 7 reasons you should go to an Indian wedding. An Indian wedding isn’t just the beautiful courtship of two souls. It’s also a time to DANCE! All Indian weddings come equipped with DJ’s and an amazing light show. It moonlights as a temporary night club. Think Punjabi MC meets the Encore at the Wynn. Even if you have two left feet, do not to worry because it’s really only about having fun and you’ll have strangers with ear to ear smiles teaching you the basics if you don’t know them already. Colorful, bright and vibrant colors aren’t just reserved for the décor. One of the coolest reasons to go to an Indian wedding are the outfits. Men were Kurta Pajama’s and ladies get decked out in Lehenga’s and Sari’s. Looking good makes you feel good and when you’re surrounded by an entire venue of friends and family looking their best, it adds yet another layer of awesomeness to the evening. We often tell people that Indian Weddings can be akin to a live theatrical performance. It’s commonplace to have choregraphed dances by family members and/or professionals. Make sure you learn how to whistle because lots of that goes around as encourages the dancers to really impress and perform. At the end of the day, life is about the moments and when these moments are shared in the company of close family and friends, the bonds grow stronger. Having drinks, dancing and laughing brings us closer together. In French the term means mouth amuser, and at Indian weddings the mouth will be on a journey of amusement with spicy, sweet and savory flavors. The spread is so amazing, that appetizers could be mistaken for the actual dinner and dessert is never just cake. Indian sweets like gulab jamun, Kheer and Mango Lassi are pleantiful and tastes particuary good alongside some hot, sweet Indian chai. Indian weddings are the perfect venue for taking pictures. Not only does everyone look good, but the decor can't be beat. Wedding halls are decorated with vibrant and rich colors. If you attend one in the future, make sure your phone is fully charged. Mehndi Night is one of the many celebrations that lead up to the wedding. It is usually reserved for women, but these days more men are joining in on the fun. Menhdi is a dye made from a plant. It's reddish and brown color has the ability to stain the skin for several weeks. 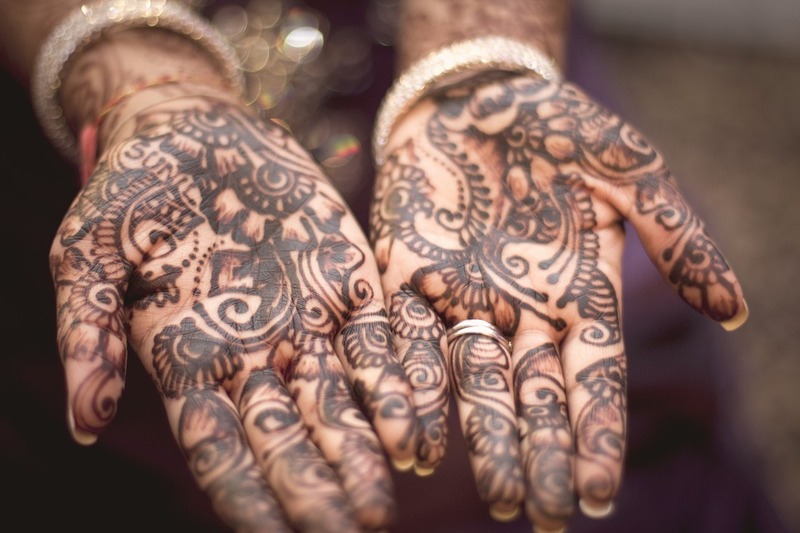 Henna artists create elaborate designs for the bride and her friends so not only their outfits standout, but also the body art work.